Home » Posts » Attentionology for K-5 Teachers » Musical Tricks to Help Kids Learn! Musical Tricks to Help Kids Learn! Ever find yourself tapping a nearby object to the beat of music around you the way I found myself tapping the steering wheel yesterday to the beat of a John Phillip Sousa march playing on my car radio? Music has the power to move us…all of us…young and old alike, everywhere around the world! Music is an international language. Composers, performers, teachers, students, many of us come from multicultural backgrounds. Sousa, for example, known as “the March King,” was born in Washington, DC (US) in 1854. Research shows that his father was born in Spain of Portuguese parents and his mother was born in Bavaria (Germany). The cultures we share can open doors to learning. As the English expression goes, “that’s music to my ears!” Your ears too? Here’s a magical musical tour…The PowWow Drum originated in North America; the Maraca in South America; the Violin in Italy; the Banjo in the Middle East and Africa, the Sitar in India, the Trumpet in China and the Didgeridoo, a wind instrument, in Australia. In forty-one italicized words we’ve traveled the world. Can you sing or play an instrument? Wish I could but I can’t, not well anyway, but I love to move to music and I know this…kids do too. 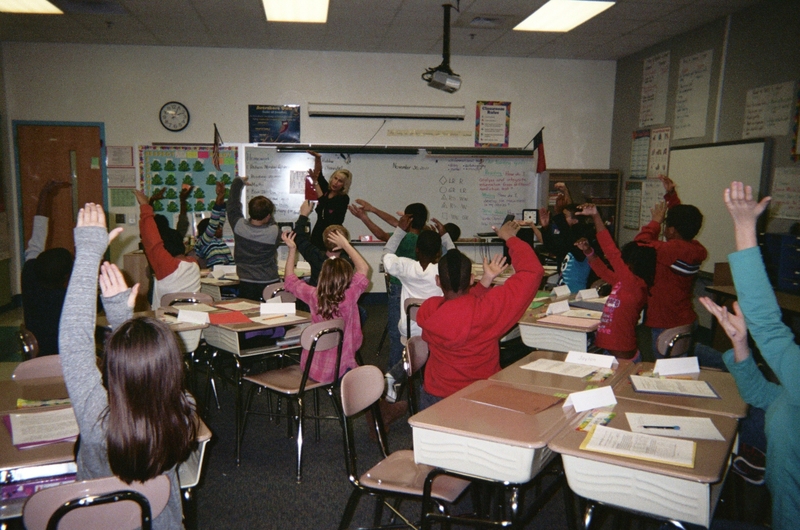 Teaching tricks that include music catch and keep students’ attention! How Does the Sun Sound? Give Us a Maraca Minute! Stage a Maraca Minute to transition between lesson. 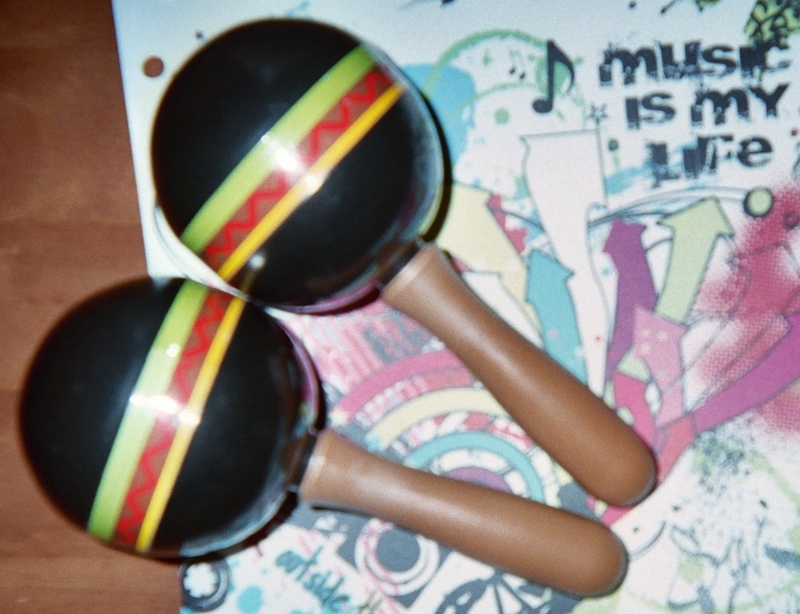 Keep a pair of maracas, like you see in my blog pic here, handy for a musical transition between lessons. For example, after you wrap up math time, announce to the class that you’d like a volunteer musician to give the class a Maraca Minute. Kids LOVE crazy-sounding words! Make up a loooong, silly sounding, attention-getting word with exaggerated spelling (like loooong) and introduce the word to the class as a cue for students to stop, look and listen to you. Optional approach to this trick: At the beginning of the school term, tell your class that you need them to help you create a crazy word cue for attention-time. Invite suggestions. Write the words on the board. Hold a vote for the class favorite. Post the winner on a classroom wall or bulletin board with a sign identifying the word’s translation: Stop, Look, Listen to (insert your name). Help students develop audio recognition and memory skills by playing different sounds at a designated time and frequency. For example, you can add this to your attentionology teaching tricks to start Mondays once every two weeks. 1) Ask a family member or friend to make sounds for you to record using ordinary and found objects in your home, such as a spoon banging against a pot. Note the sequence of sounds so that you’ll remember what sounds you’re playing for the class when you lead this activity. 2) Find a large box and collect small musical instruments and objects to bring to class. Just before you introduce this activity put the sound-makers inside the box (out of students’ sight), turn the box on its side so that you can easily access the sound-makers, and set the box on a table with the open side hidden from the students’ view. Cover the box with a piece of fabric so that it looks like a magician’s stage. Play the instruments and objects, one by one, and challenge the kids to guess what they are. Playing the role of a symphonic conductor gets the blood pumping! here. Tell them to move to the rhythm of the music. Roll a math problem into You Be the Conductor time. Play the music of a single instrument for your class, like the famous bugle composition, Taps, by American Daniel Butterfield (1831-1901). Ask the class to count the notes. Taps has only 24. Try this quick and easy variation of the game Musical Chairs. This trick works well for transitions between lessons or class activities, especially when students’ attention levels appear to be waning. Try it. Announce to the class that it’s Tambourine Time…time to stop, stand and stretch while you play a tambourine. Advise students to listen, move to the music, and sit down when the music stops. Who sat first? Kids need a longer break? Play the game again. Many teachers I’ve worked with play quiet instrumental music during class writing time. The music serves several purposes…Quiet melodic sound can be a writer’s muse. It relaxes listeners, freeing up their thinking. Quiet background music in class also sends this signal: It’s no talking time. 1 Pings/Trackbacks for "Musical Tricks to Help Kids Learn!"